This article is about the Darling in the Franxx character. For other uses, see 02 (disambiguation). Zero Two (Japanese: ゼロツー, Hepburn: Zero Tsū), also known as Code:002 or Nine Iota, is a fictional character in Darling in the Franxx, a Japanese science fiction romance and action anime television series produced by CloverWorks and Trigger. She was designed as the most prominent character and icon of the series. Zero Two is an artificially-created life form and elite pilot with an infamous reputation as the "Partner Killer" who aspires to become fully human. She is well known for addressing Hiro, the protagonist, by the eponymous term "darling". Zero Two is considered one of the most popular characters of Darling in the Franxx and her personality has been well received by both fans and critics, with the latter typically citing her as one of the best aspects of the series. 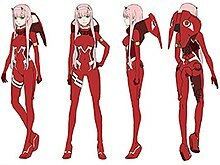 Zero Two had the most labor-intensive design process and was designed to be an iconic character to act as a flagship for Darling in the Franxx. The series' creative staff came to the consensus she should be the most eye-catching character. The inspiration for Zero Two's anime design came from character designer Masayoshi Tanaka and director Atsushi Nishigori. 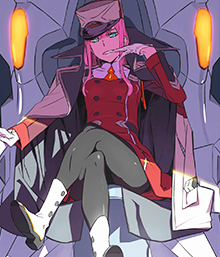 Tanaka explained that the design team was more concentrated on "what sort of existence Zero Two had", rather than her appearance, beginning with a vague image of a "badass transfer student". The initial design concepts of Zero Two were substantially subdued in comparison to her final appearance, appearing as a small, quiet, dark-haired character, before the design team decided that the design did not work with the intended personality. Her originally dark hair was exchanged for pink to assist in marketing her as the series' icon. Tanaka adapted the original design for the queen of the Klaxosaurs. The creative team considered their goal to make Zero Two an iconic character as a success, citing the abundance of cosplay and fanart. When asked by fans, Nishigori stated that Zero Two was his favorite character in the series but expressed that he was more "attracted to her charismatic personality" rather than her romantic appeal. Zero Two is an elite pilot originally belonging to the special forces unit with an infamous reputation as the "Partner Killer" due to none of her previous co-pilots having survived past three rides. As an artificially-created hybrid of Klaxo sapiens and Homo sapiens, she possesses superhuman abilities such as increased strength and rapid regeneration. Commonly viewed by others as a monster, Zero Two possesses bestial physical characteristics such as two small red horns and fangs. She began to pursue her ambition to become fully human after meeting the protagonist Hiro in her youth, and frequently questions the meaning of humanity. Zero Two has a confident and assertive personality, as well as being consistently rebellious towards the collectivist, quasi-theocratic world government depicted in the series. As a child, she was significantly more bestial in nature with red skin, blue blood, longer horns, sharper teeth, and described as having eyes "filled with hatred for the world". Growing up, Zero Two took on a significantly more human-like appearance, with red blood and light skin. Several pieces of merchandising action figures based on Zero Two have been announced. A Nendoroid, a brand of figures manufactured by Good Smile Company that typically feature exchangeable faces and body parts, is scheduled for release in December 2018. Other figures from Kotobukiya and S.H.Figuarts are also expected to be released by the end of 2018. Zero Two is a popular anime character and is considered the icon of Darling in the Franxx. She won Favorite Female Character in Anime Trending's Winter 2018 Anime Awards. At Newtype Anime Awards 2018, Zero Two won second for Best Female Character. Eric Van Allen of Kotaku describes Zero Two as "much a protagonist as Hiro" and considers her character arc as "one of the show’s best parts". Kyle Rogacion of Goomba Stomp expresses that she is "easily one of the best aspects of Franxx". Skyler Allen notes that Zero Two's energetic nature "lets her steal pretty much every scene she’s in". Tokyo Otaku Mode News ranked Zero Two twice as the best Winter 2018 character in both male and female polls. On March 4, 2018, Kim Kardashian West posted a picture of Zero Two on her Instagram profile, stating that the character was the inspiration for her hairstyle. A scene of an emotional conversation between Zero Two and Hiro became an internet meme when fans realized that their mouth movements were easy to manipulate and dub over with nonsensical audio. Popular edits involved audio such as dial-up modem connection sounds or popular music. The meme began when a Tumblr user posted an edit with barking noises over the two characters. The scene originates from episode 15 of Darling in the Franxx. ^ "第1話 独りとヒトリ" [Episode 1 - "Alone and Lonesome"]. darli-fra.jp (in Japanese). Archived from the original on January 14, 2018. Retrieved October 10, 2018. ^ Justimbaste, Kristinova. "'Darling in the Franxx' Spoilers: Voice Cast Revealed in new Promotional Video". Retrieved October 10, 2018. ^ "DARLING in the FRANXX". Funimation. Archived from the original on April 14, 2018. Retrieved February 2, 2018. ^ "Alone and Lonesome". Darling in the Franxx. Season 1. Episode 1. January 13, 2018. Event occurs at 23:32. The Partner Killer. ^ "The Garden Where It All Began". Darling in the Franxx. Season 1. Episode 12. March 31, 2018. ^ a b "Inhumanity". Darling in the Franxx. Season 1. Episode 19. May 26, 2018. ^ "第23話 ダーリン・イン・ザ・フランキス" [Episode 23 - "DARLING in the FRANXX"]. darli-fra.jp (in Japanese). Archived from the original on June 28, 2018. Retrieved October 10, 2018. ^ "DARLING in the FRANXX". Darling in the Franxx. Season 1. Episode 23. June 30, 2018. ^ "DARLING in the FRANXX Anime Video Reveals Story Teaser, January Premiere". Anime News Network. October 18, 2017. Archived from the original on October 19, 2017. Retrieved October 12, 2018. ^ a b Fobian, Peter. "Crunchyroll - DARLING in the FRANXX Creators Talk TRIGGER and Zero Two at Crunchyroll Expo 2018!". Retrieved 10 October 2018. ^ Allen, Skyler. "Interview: The Staff Behind Darling in the Franxx | The Fandom Post". Retrieved 12 October 2018. ^ Fobian, Peter. "Crunchyroll - INTERVIEW: DARLING in the FRANXX Creators Talk Franxx, TRIGGER, and Zero Two!". Retrieved 10 October 2018. ^ Valdez, Nick. "'Darling in the FranXX' Shares Original Character Designs". Retrieved 10 October 2018. ^ Frye, Patrick. "Darling In The FranXX Season 2 release date: DarliFra anime spawns a manga, but will Zero-Two return for a second act like Tengen Toppa Gurren Lagann?". Retrieved 10 October 2018. ^ "第4話 フラップ・フラップ" [Episode 4 - "Flap Flap"]. darli-fra.jp (in Japanese). Archived from the original on February 2, 2018. Retrieved October 10, 2018. ^ "The Beast and the Prince". Darling in the Franxx. Season 1. Episode 13. April 7, 2018. ^ "DARLING in the FRANXX Character Introduction Video Released! Tokyo Otaku Mode News". Retrieved October 10, 2018. ^ "Your Thorn, My Badge". Darling in the Franxx. Season 1. Episode 5. February 10, 2018. Event occurs at 19:32. What is 'human' to you people? ^ "Fighting Puppet". Darling in the Franxx. Season 1. Episode 3. January 27, 2018. Event occurs at 20:52. ^ "Flap Flap". Darling in the Franxx. Season 1. Episode 4. February 3, 2018. ^ "The Beast and the Prince". Darling in the Franxx. Season 1. Episode 13. April 7, 2018. Event occurs at 22:31. Hands clasped together, and eyes filled with hatred for the world. ^ Sherman, Jennifer. 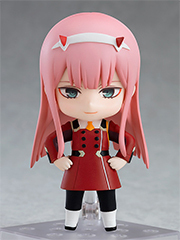 "DARLING in the FRANXX's Zero Two Gets Nendoroid Figure - Interest - Anime News Network". Retrieved 14 October 2018. ^ "Zero Two is Your Darling in the FranXX in New Figure! | Tokyo Otaku Mode News". Retrieved 14 October 2018. ^ "『ダーリン・イン・ザ・フランキス』ゼロツーが立体化、搭乗ポーズも再現 | マイナビニュース". Mynavi Corporation (in Japanese). Retrieved 14 October 2018. ^ a b "DARLING in the FRANXX, Laid-Back Camp dominates Winter 2018 Anime Awards". Retrieved October 10, 2018. ^ "Newtype Anime Awards 2018 Winners and Details Announced". Retrieved October 10, 2018. ^ "Darling In The Franxx Doesn't Make Good On Its Promises". Kotaku. Retrieved October 10, 2018. ^ "'Darling in the Franxx' Check-in: Ending With a Whimper | Goomba Stomp". Retrieved August 31, 2018. ^ "Darling in the Franxx Review - A Piece of Anime". Retrieved October 10, 2018. ^ "Top 10 Waifus and Husbandos in Winter 2018! | Tokyo Otaku Mode News". Retrieved October 28, 2018. ^ Valdez, Nick. "Kim Kardashian West Reveals Her Anime Bae To The World". Retrieved 10 October 2018. ^ Jackson, Gita. "Fans Turn Darling In The Franxx's Tender Reunion Into Dub Fiasco". Retrieved 28 October 2018. ^ "Hiro Kisses Zero Two Remixes | Know Your Meme". Retrieved 28 October 2018. ^ "Jian". Darling in the Franxx. Season 1. Episode 15. April 21, 2018. Event occurs at 19:02. ^ "Idolm@ster SideM, Bungo Stray Dogs Film Win Top Newtype Anime Awards - News - Anime News Network". Retrieved October 8, 2018. ^ "Nominees- Anime Trending Awards 2019 | Anime Trending - Your Voice in Anime". Retrieved August 31, 2018. This page was last edited on 6 April 2019, at 11:48 (UTC).